Simostronomy: New Astronomy Book from National Geographic! New Astronomy Book from National Geographic! National Geographic sent me a copy of their brand new astronomy guide to review, and I'm glad they did. 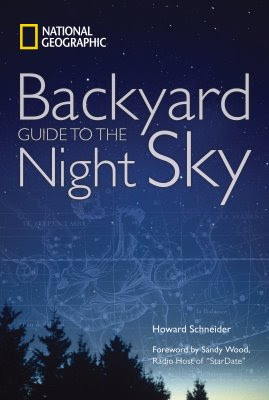 Backyard Guide to the Night Sky is a great new, up to date addition to the list of available field guides on the shelves of book sellers these days. The first thing you'll notice when you pick it up is the handy 5.5 by 8 inch carry along size. The second thing you notice, just by thumbing through the pages, is this handsome little field guide is richly illustrated. I would expect nothing less from National Geographic. The book is divided into 10 chapters, beginning with observing basics, the atmosphere, sun, moon and planets. Each of these chapters is designed into two page articles, so every time you turn a leaf you are into a new topic. This makes it very attractive for two reasons. One, it breaks up an enormous amount of information into manageable pieces, and two, each section can be referred to later as a reference on that specific subject. The brevity necessitated by this format prohibits in depth discussion of topics, but this book is meant to be more of an introduction to astronomy than a thorough text. Along with the main text, the book is brimming with sidebars, boxes, tables, fast facts and objects of interest. The progression of topics is logical and easy to follow. There are a few minor typos including the subtext for 'Five Coolest Things in the Sky' reading "Every beginning sky watcher should seek out these ten fascinating naked-eye features." But these are minimal. More importantly, I found the factual information to be correct throughout. The second half of the book deals with stars and constellations. It deals effectively with star birth and stellar evolution, double stars and star clusters. Novae, supernovae and black holes are covered in two pages and variable stars are given just a side box under double stars, but I won't hold that against this volume. Especially since it makes a point of calling astrology a pseudoscience in no uncertain terms when explaining the zodiac. Chapter seven features seasonal fold-flat, two-page star maps as shown from roughly 40 degrees north latitude. Due to the small size of the book, the all sky star maps are about the equivalent of a 7 inch planisphere. The gap in the maps between pages is most unfortunate for the winter sky. Orion, Taurus and Auriga are interrupted and lost in the crease of the book. The other seasons are less affected. Stars down to about 5th magnitude, the Milky Way, ecliptic and many deep sky objects are included and the constellations are clearly and neatly delineated. In conjunction with chapter seven, chapter eight could be considered the heart of this book. It contains charts of individual constellations. Each constellation section contains a star map, and a combination of fast facts, mythology, tables of the brightest stars and boxes containing lists of interesting objects contained in the constellation. As an example of the up to date content in this guide, the upcoming eclipse of epsilon Aurigae is discussed at some length in the chapter on Auriga. A useful feature not included might have been a guide to pronouncing the constellation names. I know experienced amateurs and professionals who still butcher Camelopardalis! Happily, several constellation's interesting objects were variable stars, including Z Cam and VZ Cam in Camelopardalis. Chapter 9 does a very good job of describing comets, meteors, meteor showers and their origins, as well as the concept of earth as target in a shooting gallery in space. Chapter 10, Deep Space, deals with the universe, the big bang, dark matter and many of the topics that are the frontier of cosmology today. The topics are treated in the same two page brevity of the earlier chapters, but nonetheless cover the ground surprisingly well in a few pages. For a book whose purpose is to introduce the reader to a wealth of information, it hits on all cylinders. This will make a great first astronomy book for any teen or adult just getting their feet wet in astronomy and observing the night sky. I consider myself to be an experienced observer, yet I found myself learning new things and marveling at the clarity of the descriptions of topics I know well. I plan to keep my copy out in the observatory for those nights when we have visitors. It will be a great quick reference for questions people always ask, like- how far, what magnitude, how big, how old, when was it discovered, etc. What's more, there are nice pictures and illustrations to help answer the questions. For $21.95 USD, this is a great buy. Go get one.